Islands are both more diverse than continental landmasses, and more vulnerable to environmental degradation. This is reflected in Jeju’s fragile yet abundant ecosystems. The national list of Korean mammals includes 71 species of terrestrial mammals on the Korean Peninsula and around 28 are present on Jeju Island. Despite having fewer species, the island has a high degree of endemism with one endemic species (Jeju striped field mouse) and three endemic subspecies (Jeju shrew, Jeju weasel, and the Jeju harvest mouse) with the white-toothed shrew potentially a fourth endemic subspecies. By comparison, the whole of the Korean Peninsula has only one endemic species (Korean red-backed vole). Despite these riches, it is hard to catch a glimpse of Jeju’s wildlife, and while watchers of bird and sea life may have more luck, it is even rarer to witness the island’s terrestrial mammals in the wild. Now an island 60 km from the Korean mainland, for most of its 2-million-year history Jeju was part of the Korean Peninsula, with its species common to adjoining southern regions. With rising seas, Jeju’s life as an island began just 10,000 years ago, and from this time its flora and fauna began to diverge from the mainland. As endemism among small mammals appeared, the brown bear was among the large carnivores which lost out, being hunted to extinction in the prehistoric era. Another extinct land mammal, the leopard cat, survived until the 1940s. Still present across the Korean mainland, the reintroduction of the leopard cat is a tantalizing prospect for proponents of rewilding. 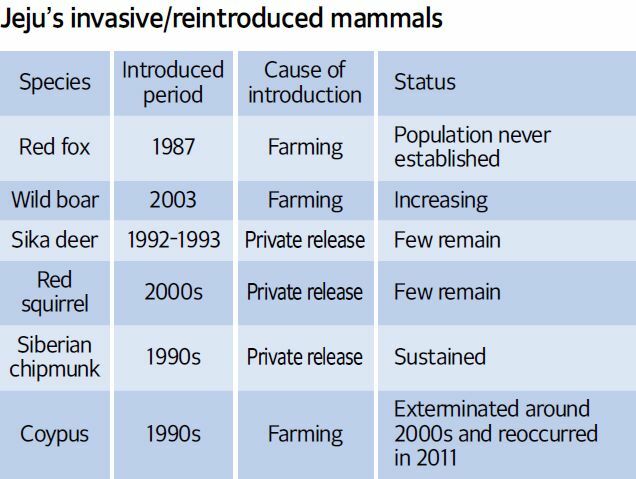 Two once-extinct species have been reintroduced already, sika deer and wild boar, although these were not planned releases having escaped from private farms. Non-native invasive species also pose a threat to Jeju’s island habitats such as the red fox (now believed to be absent), the red squirrel, Siberian chipmunk, and even the beaver-like coypu. What follows is a broad outline of Jeju’s terrestrial mammals as drawn from an article by Yeong-Seok Jo et al. (2012) in the Journal of Species Research. Bats are numerous in Jeju’s caves and cliffs including potential endemic subspecies of the greater horseshoe bat, the Japanese pipistrelle and the Alashanian pipistrelle, which is on the IUCN Red List of endangered animals. Mouse-eared bats (myotis) are also common on Jeju including the far eastern myotis, also on the IUCN Red List, and the rare Hodgson’s myotis. Other species include the extremely rare Ikonnikov’s myotis and the more common big-footed myotis. A specimen of the Southeast Asian long-fingered bat identified on the island in 1986 is regarded to be a vagrant, but a population of Schreiber’s long-fingered bat is seasonally present as is the greater tube-nosed bat. The Jeju shrew is an endemic species, distinguished from mainland varieties by slight differences in upper-jaw premolars. Jeju is also home to Korea’s only population of Asian lesser white-toothed shrew which, being larger than varieties in Japan, could even be an endemic subspecies. The endemic Jeju striped field mouse (also present on Wando Island, South Jeolla Province) is distinct from mainland varieties and, as the most abundant rodent on Jeju, is found on grassland, hills and shrubland throughout the island. The Jeju harvest mouse is regarded as an endemic subspecies and inhabits low-lying grassland and mid-mountain silver grass up to 1,200 meters. Another endemic subspecies among small mammals is the Jeju weasel which is distinguished from the lighter Siberian weasel by its dark-reddish fur. It is common around villages and farmland and, being elusive, is unfortunately most likely spotted as roadkill. Slightly larger is the Asian badger which scientists thought absent until the first specimen was confirmed in 1958. Research now suggests Jeju has the healthiest badger population in all of Korea with additions to the gene pool from farm escapees. Their preferred habitat is woodland on mid-mountain volcanic cones. Going extinct sometime in the early 20th century, the wild boar re-established itself in recent decades after animals escaped from a local farm. Also inhabiting upland woodland, genetic analysis shows that the population is descended from escaped Chinese boar. 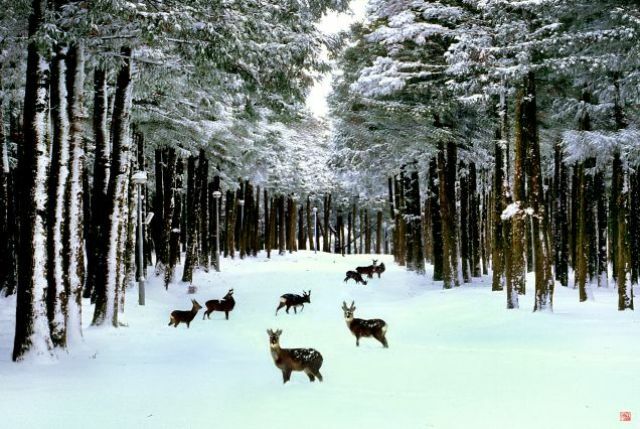 Most famous among Jeju mammals is the Siberian roe which inhabits the heights of Mt. Hallasan down to coastal woodland. Sika deer were also once numerous before being hunted to extinction in 1915. Then, in the early-1990s, 12 Taiwanese animals were released by a local landowner; however, the status of the current population is unknown. 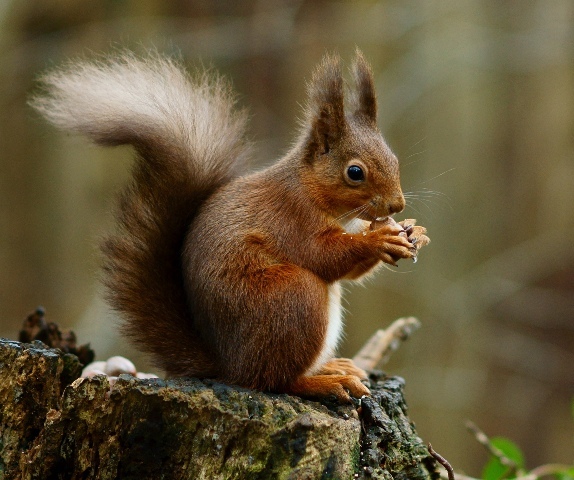 Surprisingly, the Eurasian red squirrel is also present on Jeju after being released by pet owners around the year 2000. They are thought to be present in the coniferous forests on the south slopes of Mt. Hallasan although population data is scarce. Another introduced woodland species is the Siberian chipmunk which was first recorded in 1985 after suspected intentional release. The population is now significant across lowlands and woodland up to 1,300 meters. Both the most intriguing and concerning of Jeju’s mammals is the coypu (or nutria), a beaver-like rodent native to South America which inhabits marshland and wetland. There are several coypu farms on Jeju and four individuals were found free-roaming in Seogwipo wetland in 2011. This population is of high concern due to Jeju’s unique and fragile wetland habitats.